No one has time to keep up with every game being produced these days: it’s often hard enough to keep up with the onslaught of AAA titles (mostly shooters or MMORPGs these days it seems, though action/adventure titles have seen a resurgence of late). As an avid RTS aficionado, I make it a point of honor to seek out and inform others of the exciting (and maybe sometimes not so exciting, to be fair) developments in the RTS genre. One of the bigger issues RTS seem to have these days is simple recognition: it’s far too often that someone will see a great game brought up in conversation and express that they’ve never even heard of the title, they would’ve loved to play it if they’d heard of it while it still had a community. So, without further ado, I present my watchlist: a list of RTS games that I think people might be interested in. I hope you see at least one that interests you! I’ve covered some of these games in previous Watchlist entries, but know much more about many of them than I did previously. If you know of other games not listed here, please post information about them in the comments or contact me via twitter, Facebok or email. I want this list to be as comprehensive as possible. I’ll admit, I was more than a little skeptical when I first heard of Act of Aggression. I’d never played its predecessor, and my experience with Eugen’s games had left me with the utmost respect for their mechanical design, but frustrated greatly with the accessibility of their games. in short, I love the design of the Wargame games, but feel that they’re very hard to get into thanks to their learning curve. But, despite my reservations, I preordered the game and decided to give it a whirl. 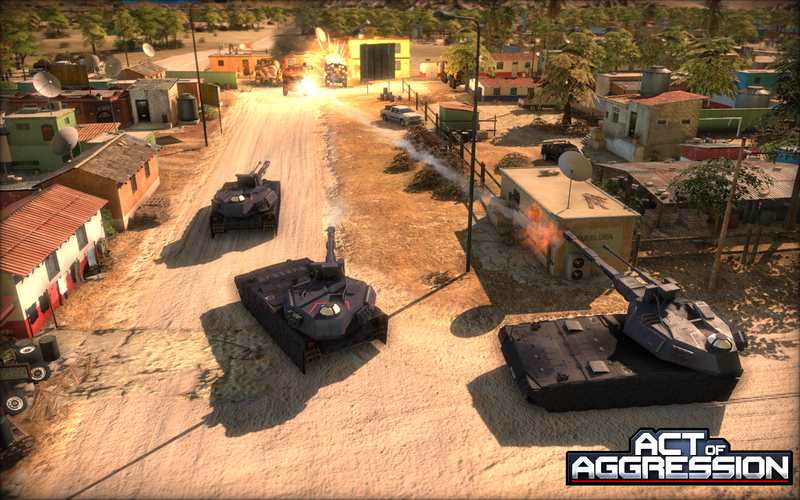 Act of Aggression bills itself as a return to the glory days of the RTS genre, and I’m not even sure why it needs to – it is a gloriously complex and grandiose vision of the genre that feels refreshing and engaging, no throwbacks to nostalgia necessary. 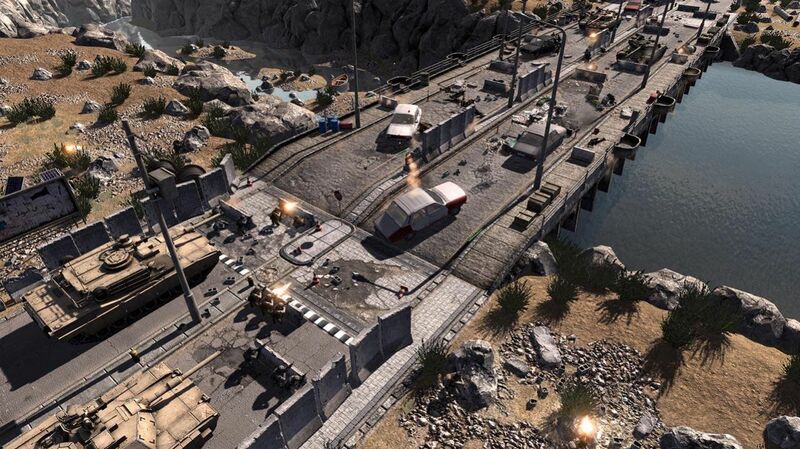 At first blush, Act of Aggression looks to have something to offer for almost every stripe of RTS gamer: it has large maps full of towns and cities with capturable and garrisonable structures; high ground plateaus that can be traversed by infantry, roads that make ground vehicles move faster; it is made for rushers and turtles, for army composition snobs, for those interested in games with more than StarCraft-standard 2 resources. Each faction has unique mechanics and even unique uses for the game’s 4 resource types (I’m counting Power as a resource here – there are 3 mineable resources)… Again, at first blush, this game has a staggering array of features and feels remarkably well polished for a game whose third faction isn’t even available yet. The issues with Act of Aggression are similar to the issues with the Wargame titles: it has a real potential to be a victim of its own complexity, scaring off newcomers who don’t have the wherewithal to learn its systems. I consider myself a fairly savvy RTS player, and it took me upwards of 7 hours to gain an understanding of the game’s tech tree for one of its factions, to say nothing of the pacing of expanding economy vs increasing tech level vs building up forces. While players are likely to appreciate the game once they learn it, mastering its learning curve is more frustrating than that of many other RTS which might drive people to those games instead. On another note, the camera is quite close in, though Eugen may be addressing this issue in a patch, and they did build in a “RADAR mode” that allows a wider view of the battlefield. Also, despite the scale of the game units themselves do not seem very dynamic, which might disappoint players who are used to the interaction models in games like Company of Heroes. Publisher/developer Stardock has been on a roll lately, developing games like Sorcerer King and Galactic Civilizations 3 in house, and working with RTS giants like Dave Pottinger (from Ensemble and Age of Empires fame) on Servo and Soren Johnson (Firaxis, Civilization franchise) on Offworld Trading Company (both of which games I’m going to be mentioning below, don’t worry). One of their more ambitious RTS experiments, however, is Ashes of the Singularity in partnership with Oxide Games. Oxide is staffed with its own ex-Firaxis crew of developers, as well as an art director who worked on Battle for Middle Earth 2. 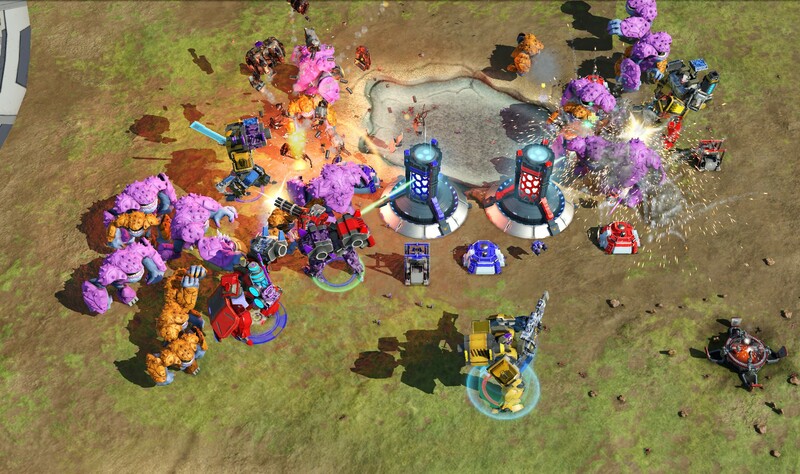 The game itself, Ashes of the Singularity, is aiming to combine the epic scale of games like Total Annihilation and Supreme Commander with units designed like those in Company of Heroes 2, such that certain classes of unit will be virtually immune to certain types of attack. They’re aiming to have the player manage the game’s epic scale with what they are calling ‘meta-units’ or what essentially amounts to groups of units working together like a single larger organism. What Oxide is aiming for is automation that would allow healer units to automatically prioritize low-health units to heal, for units to auto-target their preferred enemy types so that the player is free to manage the game at a high level while the ‘meta units’ handle their own interior affairs. All of this is to be managed via a new engine called Nitrous, which is intended to be used for handling high levels of visual and systems complexity in games (supposedly it’s intended to be especially suited for RTS games). While a game with the scale of a Supreme Commander and the intricacy of a Company of Heroes sounds enticing and even potentially intoxicating, we are dealing with uncharted territory here. Every element from the gameplay engine to the AI that will control the ‘meta units’ is a potential failure point. The story is still in its early stages, as well – at least, the story as revealed to us plebs who aren’t Founders with inside info on the game’s development. It remains to be seen whether the lofty goals of Ashes will be met, and whether they’ll coalesce into a compelling gameplay experience if so. And the game’s polish and narrative flare, which are currently underwhelming, have a ways to go before they’ll entice today’s jaded gaming audience. Blitzkrieg 3 is the continuation of the fairly popular Blitzkrieg series of tactics games from Russian developer Nival Entertainment. 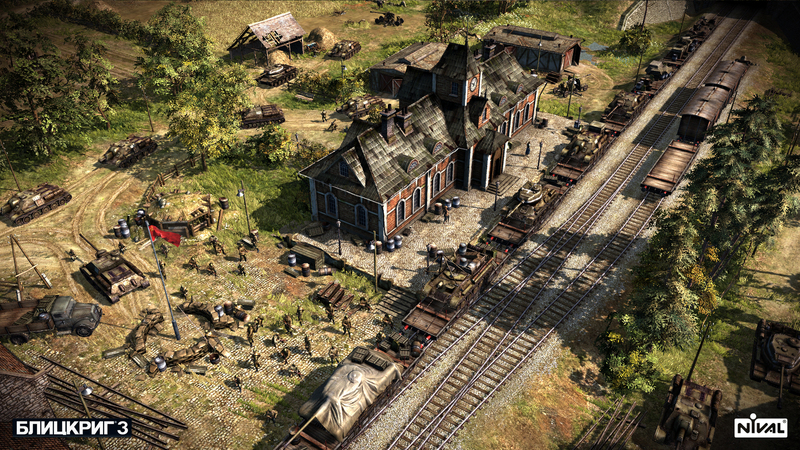 The Blitzkrieg games were well known in their time for the large number of units included across the games’ campaigns, the destructible nature of the game’s environments, and general attention to detail. When it first went into Early Access on Steam, Blitzkrieg 3 made the controversial decision to focus on an ‘asynchronous multiplayer’ mode, which effectively functioned like the combat seen in Clash of Clans, Royal revolt 2 and many similar mobile games, albeit without the requirements of using resources to attack or having to re-purchase armies after every foray. Essentially, each player would lay out a defensive position and base, to have enemies assault while the player, in turn, would assault the (AI controlled) base of other players in the game. If the player were not able to crack his opponent’s automated defenses within the match time limit, the opponent would be awarded a win. Either way, in no case would players be matching wits in real time the way it’s been done back to and before the beginning of the real time strategy genre itself. Love it or leave it, Blitzkrieg 3 was looking to have as much in common with mobile “MMORTS” games as it was with its own heritage. However, Nival recently announced that traditional multiplayer would be making its way into the game, which has rekindled the interest of the Wayward Strategist. Blitzkrieg is one of the storied and beloved tactics titles out there, and a return to true form is more than welcome for the latest entrant in the series. And actually, the fact that Blitzkrieg 3 will have both traditional player vs player combat, and what could be seen as a more casual or less stressful alternate mode, the so-called asynchronous multiplayer, might work in its favor. Even core RTS and RTT gamers occasionally want to play something less mentally demanding every now and again. In its day, Blitzkrieg was overshadowed by Warcraft 3 and other mainline RTS games. 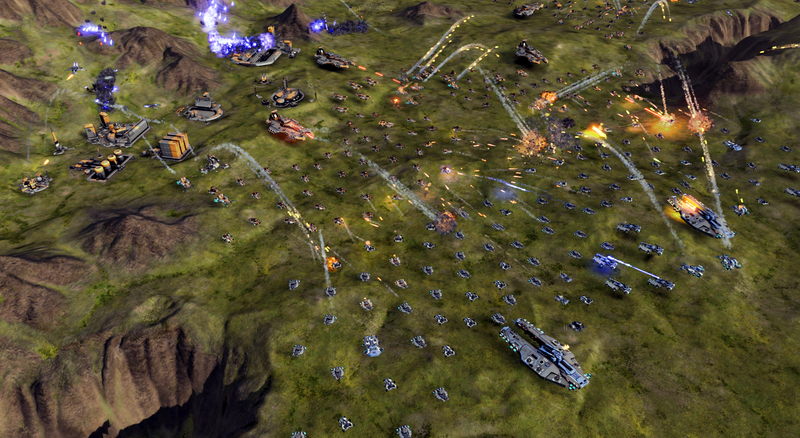 in 2015, the RTS genre is itself none too popular, and the real time tactics sub-genre has been all but abandoned, with mainline RTS gamers tending to prefer games with more traditional basebuilding as seen in StarCraft, C&C, Age of Empires etc. While World War 2 games certainly have their audience, Men of War: Assault Squad 2 and Company of Heroes 2 indicate that the setting will only take a game so far. The game’s dual multiplayer options and storied history may (and hopefully will) make a meaningful number of players take notice, but it’s just as likely that core tactics gamers will read old and outdated previews and reviews of Blitzkrieg 3 and dismiss it out of hand for once having the temerity to pit players’ units against static defenses set up by other players. Lately, we’ve seen a trend of studios attempting to stand out by focusing on tactical combat over economic management in RTS games: Company of Heroes 2, Men of War: Assault Squad 2, and Blitzkrieg 3 are easy top-of-the-head examples. Call to Arms is another entrant into the list of ‘tactical’ RTS games and seeks to stand out by focusing on unit customization and the ability to take control of units and ‘play’ them in the first person, similar to the Carrier Command remake or classic RTS/FPS hybrid Battlezone (and its sequel). At this point the game is not feature complete, and still apparently has a long way to go. Company of Heroes 2 had a rough launch, but it has developed into one of the most content-rich and meaningfully deep modern real time strategy games. With 4 factions, 2 campaigns, some respectable mod tools and a wealth of story driven and player created content, CoH2 has already come a long way towards becoming a solid game and a solid platform for modder creativity with the potential to last for years. This latest update will add a 5th faction, the British Forces, whose mix of offense and defense should be most welcome in both 1v1 and team multiplayer matches, with more single player content almost sure to come somewhere down the line. This is a bit tongue in cheek, so let’s take it with a grain of salt. But, if the British Forces launch slightly overpowered, or even if they perform well due to other players not being able to handle their strategies, Relic will be accused of designing the faction overpowered to sell more copies. if the British Forces launch and are underpowered, Relic will be accused of incompetence. If too few commanders are released, players will complain and if too many commanders are released, players will complain. Regardless, players will complain about this new content. Overall, it should be a fairly good addition to the game unless the faction is wildly overpowered, in which case it could depress player numbers while the game balance is ironed out. Where to begin? First off, there are indications that previous games in the series (the first game had a different title but seems to have be made in the same basic way) started adding micro-transactions after launch and some players indicate that they expect this game to take a similar tack. Not that micro-transactions are, per se, unethical or problematic (at least in the humble opinion of this writer) but depending on what the game decides to sell, the ugly spectre of the “pay to win” or “pay for power” model is a potential. Gamers with low views of micro transactions will want to approach Kingdom Wars carefully. The game also seems like it might be trying to bite off more than it can chew. The game’s site promises players that any MMO (read: progression) features would be optional, but fails to elucidate how it would achieve this. Massive battles sound great, and if breaking defenses and fending off NPC zombie hordes sounds like a good way to spend some hours, maybe give this game a look. But be wary of games that over-promise and under deliver. Let’s not beat around the bush, from the perspective of pure mechanics, Offword Trading Company is one of the most elegantly designed games I’ve seen. It also has one of the most straightforward and gleefully tight concepts in the RTS space: the player represents a Mars-based corporation, intent on growing to buy out their competition and be given license to sell their goods offworld. Hence, the game’s name. 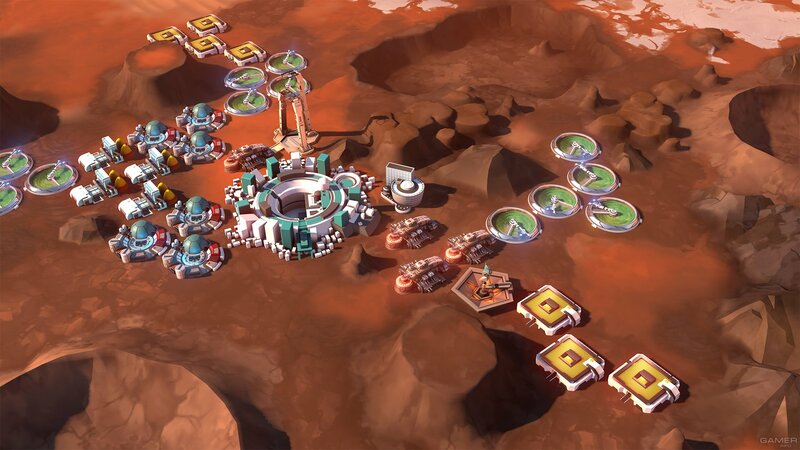 Despite all its elegance and cleverness, something still seems a bit hollow about Offworld Trading Company. Perhaps it is primitive and thuggish of me, but there’s something incredibly satisfying about building an army of tanks and crashing it (sometimes literally) into an opponent’s army of tanks, or space insects, or psychic elves, or what have you. Manipulating a stock market and buying land just doesn’t have the same visceral component as commanding phalanxes, or fleets of starships, or waves of tanks (at least for this writer). At the very least, however, watch some of Soren’s commentated matches on the game’s YouTube channel: watching Soren describe his game was what got me to purchase it in the first place. BonusXP had a simple idea. Players love designing their own units, but also need to have a tightly balanced game where units are known quantities. 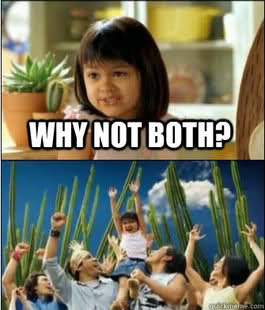 in Old El Paso fashion, they declared “why not both?” and created Servo, an RTS where players build armies from a list of well defined units, while also being able to call in formidable Servos, custom-designed mechs built of components the player has cobbled together, designed from more or less the ground up by the player. Servo is still in its early days, but BonusXP, led by ex-Ensemble game design veteran Dave Pottinger, who’s worked on every Age of Empires from 1 to AoM, has a compelling vision that’s slowly but surely being fleshed out with each patch. The core of the game is the Servo, of which a player can have 3 in a singe battle. These behemoths tower over the game’s other units, and behave somewhat like heroes in MOBA titles, with the notable exceptions that 1) the player designed these mechs, including all active abilities 2) the player can field more than 1, and 3) the Servo doesn’t level as a hero would. instead, the player is tasked with simultaneously building an economic infrastructure to support the Servos, from supplemental combat units to damage and armor buffs, to placing mobile repair stations and capturing Bloomwells (the game’s resource nodes) around the map. It’s an interesting combination of MOBA, RTS, and good old playing with action figures in a sandbox. 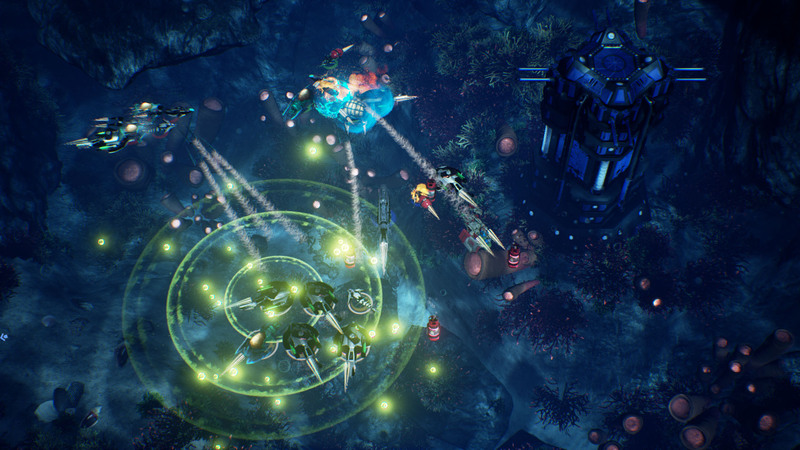 While BonusXP have a compelling vision, the game is still fairly early in development: the current stock of weapons and upgrades (at least, that I have unlocked) while fairly broad, don’t have the dynamic interest that you tend to see in MOBA hero abilities – can’t, really, as some combinations would be potentially too over the top (imagine being able to mix and match from any hero ability in DOTA). There has been a steady influx of new Servo parts, however, making me confident that this will improve over time. There is currently also only one faction, with a limited number of units options, basically consisting of healer, melee specialist, ranged specialist and artillery. While units are undeniably necessary, more variety and dynamics here would likewise be welcome. Finally, the game’s progression model can be a frustrating barrier to play: the player feels gimpy running around with mismatched Servo parts of dubious quality, needing to play to earn parts, and needing to have decent parts to compete. Servo is definitely worth keeping an eye on, but those unwilling to wait and see how a game develops, or to provide meaningful feedback during development, may want to take a rain check until Servo is a bit more complete. Inspired by games like Homeworld and Nexus: the Jupiter Incident, indie studio Special Circumstances has set out to create a fleet-combat opus of their own. 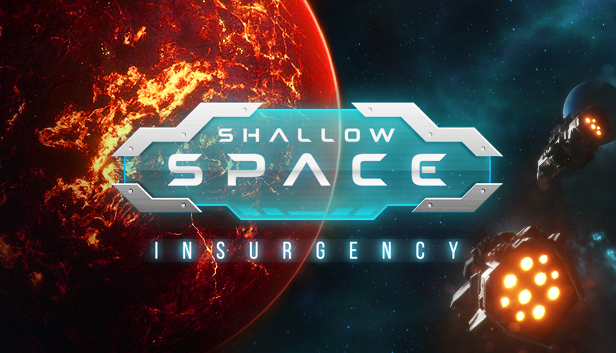 Featuring ship design and a robust fleet management system, Shallow Space is not content with being a half-baked experience: they are crafting a true 3D RTS, something that sadly, few games in the industry seem to want to do. I’ve played my fair share of 2D space RTS titles.The emphasis of Shallow Space is on scale and customizability, with players owning large flotillas of ships, mining interests and satellites. Ships will have customizable weapons batteries, shields and armor, with captains that provide unique bonuses. Honestly I have few specific reservations about this game at this point. In general, untested studios can potentially have problems with animation quality including things such as move speed/responsiveness, overall game pacing and balance, plot/writing quality, et cetera. Perhaps the single largest issue with the game at this point is the game’s site doesn’t give a very clear indication of the actual gameplay: how ship design and construction works and meshes with what basebuilding the game has… Being able to describe a game in a way that makes sense to potential players is vital for game developers and so far I have not seen this from Shallow Space. Still, if you’re a fan of Homeworld or Nexus, I’ve seen few games that try to reproduce, let alone exceed, either of these titles, and the Shallow Space team is nothing if not dedicated. I’d recommend keeping an eye on this one. Warning: I am a huge Starcraft fan so I may be slightly excited about the release of Legacy of the Void. As the final expansion of the Starcraft 2 series Legacy of the Void will bring conclusion to the characters we’ve been following since 1998 while also expanding on it’s multiplayer platform. The first two expansions of Starcraft 2, Wings of Liberty and Heart of the Swarm, have already made Starcraft 2 the best selling real time strategy game of all time, that lead is expected to grow with Legacy of the Void. Along with the expected campaign and traditional mutliplayer modes, Legacy of the Void will also include two new multiplayer modes. 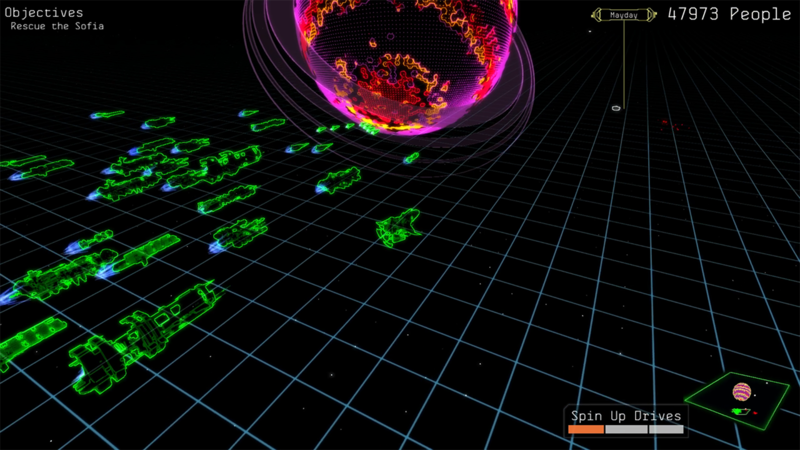 The first is already in beta testing, and we’ve discussed it briefly on this site, and is called Archon mode. This new style of multiplayer puts two players unified on one base in a standard 1v1 style map but they share duties. The second new mode is called Allied Commanders and has two friends select commanders with unique units and abilities and help each other overcome campaign style situations. As they play missions together they level up their commanders gaining new strength. 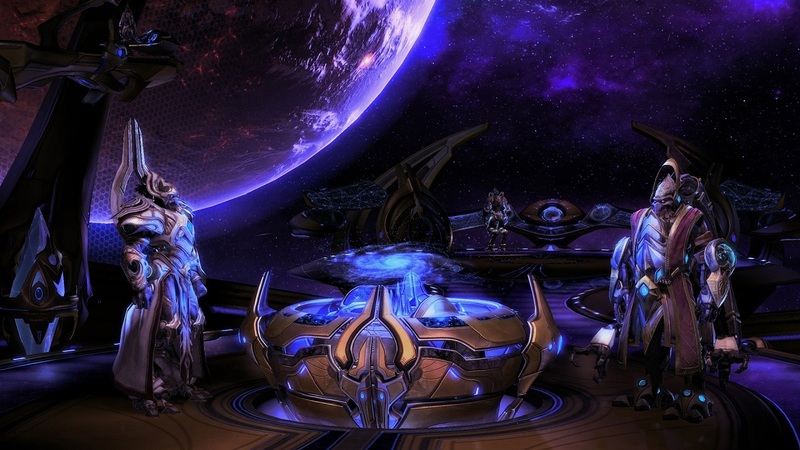 These new modes along with improvements the games menus, graphics engine, ladder system and new training, Legacy of the Void appears to be the definitive version of Starcraft 2. 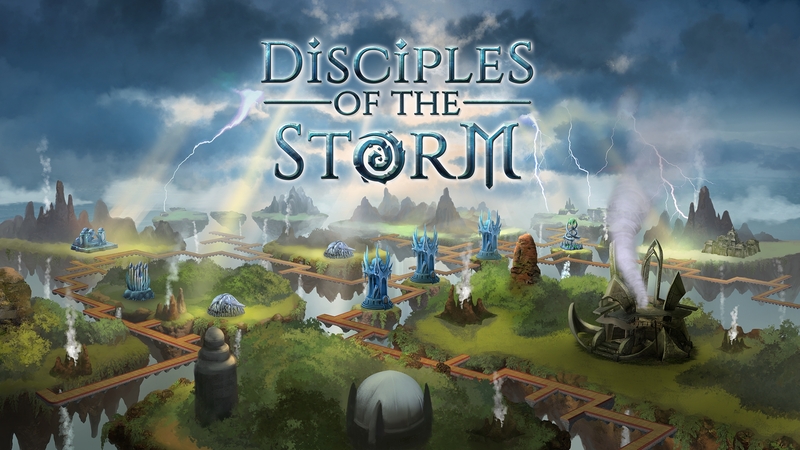 While there is features for new players, for the most part RTS fans know whether they will be getting this game by now. You know what you are getting for both the campaign and 1v1, what may draw new fans are the additions. Considering the time it takes Blizzard to make games it should also be the last real time strategy they make for another half decade or so. It’s the second expansion of Starcraft 2 and it will be coming out almost 6 years after Wings of Liberty so it’s no spring turkey. Game series tend to lose momentum with expansions year after year and while this is still the biggest name in real time strategy, it likely won’t have the same impact Wings of Liberty did purely due to it’s age. While Blizzard’s two new modes, Archon and Allied Commanders, are intended to ease new players into the game with less stress and using friends to lean on, Starcraft 2 is still a very daunting game for even some avid RTS fans to start laddering. But with the support of a dedicated, and large, company behind it the ladder isn’t expected to shut down soon and while we don’t know the impact the new beginner friendly modes will have it will certainly be easier for new players to start playing the game. In the end the Starcraft 2’s 1v1 ladder is still going to be a huge mountain to climb for new players. Submerge is a tactics game that sounds vaguely like End of Nations fought underwater, with players squabbling over air and other resources with pre-designed fleets of submersible craft in tactical battles rather than traditional RTS fights with unit production, resource gathering and base building. It’s planning on having a persistent world with instanced battles of up to 16 vs 16 players within a match. Like Call to Arms, Wayward Strategist did not gather sufficient information on the game to provide either a recommendation or a warning to players. Almost every RTS that comes out these days makes multiplayer either its primary focus or is at least interested in balanced fights between 2 entities of roughly equal power. Not so single player RTS “XO” whose premise is that the player controls the beleaguered remnants of a space fleet, for whom ‘winning’ means escaping with minimal casualties. This isn’t a game of triumph over a powerful enemy, this is a game about escaping from an overwhelming enemy that isn’t interested in talking, and who drastically outguns the players own forces. XO puts the player in the boots of the commander of a fleet of military ships tasked with protecting civilian convoys, and asks the player to manage the vagaries of intrapersonal conflict with a fleet council whose objectives and methods may differ from that of the player. The game includes procedurally generated systems and missions, with the intent to provide large amounts of replayability. XO has some lofty goals, but with that comes commensurate burden on the game’s developer, Jumpdrive Studios, to follow through. From an interesting, but certainly non-traditional visual style to what sounds like a potentially Banner Saga-esque “no decision is good enough” gameplay model, player expectations will have to be managed (RTS players tend to like to, well, win) and AI will have to be solid – if you’re going to be interacting with an NPC fleet council, poor AI could ruin the potential fun implied in this decision making process. Additionally, it always pains me a little when I see a space-based game that doesn’t take the third dimension into account. Space is not a flat plane, and treating it as such always feels like a lost opportunity. Prev Wayward Strategy’s Top 20 RTS Units of All Time!